I did this illustration in the Precambrian era, so go easy on me. Anyhoo, the good folks at Cricket asked if I would be interested in doing an illustration for their article. And of course, I was all like, "Do worms love dirt?" I tend not to be particularly fond of my old work, so I was happy to have the opportunity to get a kind of "do-over" with this illustration. I'd be striving to put right what once went wrong, like on "Quantum Leap", accept with slightly less time travel. The first thing I did was draw up some concepts. Well, actually, the very first thing I did was sit down and think about how I wanted to approach the illustration. I read the article, looked at reference photos, and wrote down a pile of ideas in my illegible note-taking scrawl. 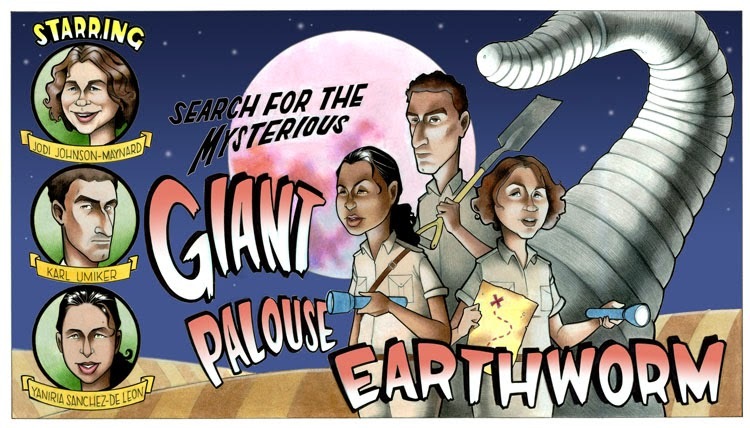 It's interesting: I can't actually remember when I drew the original "Giant Palouse Earthworm" illustration, but the difference between the two illustrations seems stark to me. Time, more practice, and changing taste meant that I made different decisions this time around. Overall, I'm satisfied with the way the new one turned out. I think the craft is strong, the composition is decent, and the colors are interesting. There are always at LEAST a few things in every one of my illustrations that I dislike. And I could list them, but I'm not going to. Not this time. This time, I think I'll just accept that I had fun with this project, that it turned out pretty well by my standards, and that I'm happy with it. And I'm going to leave it at that. Don't worry, I'll be back to my usual, overly-critical self soon enough.